Ernesto left his native El Salvador in 1997 due to the severe economic burdens he and his family faced. The sacrifice was enormous and the options were few. He felt no choice but to leave behind his wife and three small children, just 1, 2 and 3 years old at the time, and provide for them by working in the United States. Back in El Salvador, his wife struggled to take care of the three small children, Yesenia, Jessica, and Edgar. The heartaches abounded and finances were stretched to the limits. By the early 2000s, the situation in their neighborhood began to worsen as the gang violence was on the rise and families were being threatened if they did not pay their “dues” to the gangs. It got to the point that Martha, Ernesto’s wife and mother of Yesenia, Jessica and Edgar, would not even go out with her children because it was so dangerous. One day she barely escaped from them as they chased her in an attempt to rob her or even worse. This is when Ernesto and Martha decided that it was best for Martha and the children to also come to the U.S. The decision was not an easy one, as they both knew the grave risks involved in making the journey, especially for a mother with children. This was also another huge sacrifice as they saved up over $20,000 to make this possible and hopefully, bring the family to safety. Martha and the children made it safely to the U.S. and reunited with Ernesto in Maryland. The children were reunited with their father who they had not seen in nearly 10 years and did not know at all. Martha says “Well, of course we encountered problems that any family would, especially financial, but the important thing is that we were together.” The children began the 5th, 6th and 8th grade and at first struggled with the language, but it was not long at all before they were thriving in school. 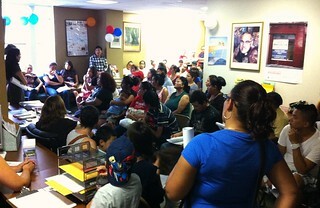 Youth and parents gather at CARECEN to learn about Deferred Action. Growing up undocumented was a harsh reality the children faced routinely. There were many opportunities that had to be passed up, because of their lack of legal status. The eldest, while in high school, was recommended for a part-time job with the county, but she was not able to accept it. The announcement of the new Deferred Action for Childhood Arrivals (DACA) in June was a blessing for thousands of families in the area, including Ernesto and Martha’s. Ernesto knew exactly where to go for help: CARECEN. He himself, as a beneficiary of Temporary Protected Status since 2001, had renewed this status several times with the organization. Now, all three of his children are receiving assistance in applying for DACA. They were all eligible and submitted their applications in early September. They are anxiously waiting for a response. The oldest, Yesenia, just graduated high school in May. Since then, her life has been virtually on hold as she cannot work and does not have enough money to go to college. Her goal is to work for one year so that she can save up enough money to go to college and begin to take a few courses. Edgar is the youngest child and is currently in 11th grade. He knows exactly what he wants to do if his application is approved. He wants to get a part-time job on the weekends and is adamant about helping out his parents and also saving some money for his college. He is happy that he will have more freedom to pursue his dreams and help out his family as much as possible.